My Inside Voices: How do you make sure not to outgrow your characters? How do you make sure not to outgrow your characters? 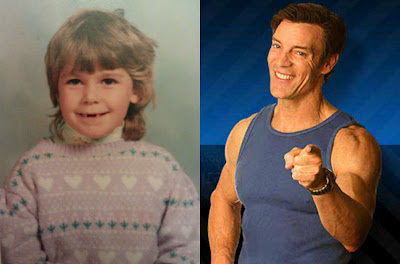 The secret to my success: Me circa second grade and fitness guru Tony Horton. So, secretly (well now, not so secretly) I worry that by the time I finish writing that novel I'll have outgrown it. And also that maybe I'll be too old (more on that eventually). At her birth I was in my mid-20s and so I imagined Eleanor to be in her mid-20s. And while she's not some thinly veiled version of me, our places in life were going to be parallel. We were both in that period of settling into adulthood. Terrified and exhilarated by our independence. But I've undergone some considerable life change -- marriage and children. My new life carries a whole new set of characteristics and routines that seem so foreign from how things were just a few years ago. What if I'm forgetting my mid-20s mindset and am unable to make Eleanor believable? See, this is the problem with being a journalist/wannabe novelist. When I consider writing the book (and that's about all I do now with it -- consider it) I am concerned that I won't be able to make it feel genuine if it's not based on experiences that are clear and understandable to me. I'm walking this bridge between nonfiction and fiction, when instead I need to just dive into fiction and just trust that the nonfiction of my subconscious will seep in as necessary. Is that what actual novelists do? Perhaps the real problem is that I need to do some fiction-writing training to help me be more confident and less inhibited. Someone should make a version of P90X for wannabe novelists. A more literary Tony Horton could implement a 90-day cerebral exercise routine where doubtful, lazy, procrastinating and excuse-laden writers would do some imagination strength training and pound out the damn book already. (That actually might already exist in the form of National Novel Writing Month, which I participated in in 2011 to the tune of 18,000 words -- far short of the 50,000 needed to "win"). Also, if I could have a beach body at the end of three months, that would be OK, too. When I was in elementary school I loved writing and illustrating stories. I was thrilled when the teacher handed out newsprint that was half lined and half blank -- so you'd write out your story on the bottom half and draw pictures on the top. Why was it so easy then to invite worlds and people to inhabit them? So here's what needs to happen: I need to awaken my inner Susie (that's what people called me back then) -- but hopefully I'll ditch the ugly sweaters and bad hair -- while simultaneously developing some sort of inner-Tony Horton/Editor hybrid to force me to get the cursor to stop blinking on a blank page.